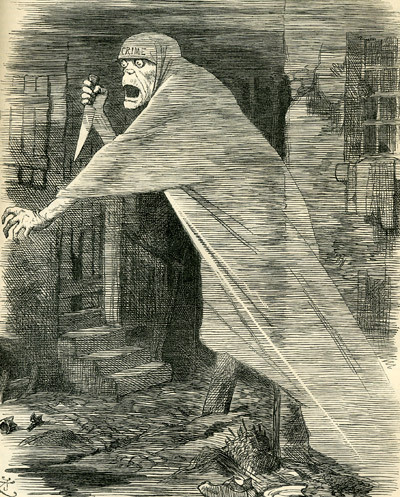 The Agony Of Fear In The Whitechapel Murders. By the 10th of October, 1888, the Jack the Ripper crimes were being reported upon and pondered upon by newspapers across the country. From Land’s End to John O’Groats, journalists were pondering what sort of person could be carrying out the type of cold-blooded atrocities that had been terrorising the East End of London, and, more importantly, what could his possible motive be for choosing as his victims a class of woman who had little of value for him to steal from them. thus ruling out material gain as a motive for his crimes. In its edition of 10th October, 1888, The John O’Groat Journal published the following article which tackled the sort of questions that were beginning to be asked about the identity and motives of the perpetrator of the Whtechapel murders. “There are few things in a great city more perplexing and demoralising than the agony of fear. Those who remember the visitation of cholera, or have read the dread produced by the progress of a great fire or plague in a dense population, have realised somewhat the strange humanitarian sympathy that passes from eye to eye and tongue to tongue at the back of a great murder or sudden calamity. In the case of a boiler explosion, or a bridge subsidence, or tenement collapsing, or a break in some waterwork overflowing, with accompanying death and disaster, there is the immediate panic which is met by devoted action, and resignation quickened by fortitude; this, however, in the case of methodical murders produces, at first a great horror of fear, and then determination to hunt down, by all the forces of civilisation, the murderer. It is an eloquent tribute to the value human life that out of a population of 3,832,000, half a dozen of poor unfortunates cannot be sent murdered out of the world, unnoticed and unavenged. Within the past three weeks, the criminal authorities of London have been working night and day to unearth the perpetrator of the Whitechapel murders. The murderer seemed to combine the dexterity of the Indian thug, with the rapidity of action of a professional animal slayer. Indeed the method of procedure pointed to one who seemed to be in the habit of handling dying animals. A general consensus of opinion pointed to the murderer being a lunatic, animated by a special object. It did not seem that the object of the murder was for plunder, or perhaps the goods might have identified the person who committed the deed. There remains the other motives, those of revenge or of religious purging. It may have been that the man had returned from India, was robbed, left in London without a copper, and the desperate character of the position prompted to the dreadful series of acts. On this one subject, the man may be a monomaniac. All his other acts may appear calm, natural, and free from the slightest trace of mental affliction; but, on this one subject, his acts combine the cunning of the tiger with the fierceness of the wolf. That some poor unfortunate may have met wrong with wrong, and the wretched man determined to do the Herod on the locality seems not at all unlikely. He may even consider that he had a holy mission to murder out the class. In all likelihood, the man lives within the district, and in some store thought to be unused for human dwelling. It may be in some cellar, entering from some place in daily use; or aloft in some attic piled up with broken furniture or the remains of packing boxes. God knows the places in which the poor stowaways of crime and humanity in London take refuge, and none with a keener appreciation than those fleeing from the law. It may be, however, that the murderer is very near the limbs of the law. It may be he is within hearing of the criticism of his work, and able to appreciate how the tangled skein of crime is being joined together. A missing link, a fatal word, a slip of the tongue, may start into life whole world of avenging furies willing to lay hands upon his head. Already many have taken, and in that madness of delirium fearfully like the shadow of hell, given themselves up for a crime that they have never committed, and, have been released after proving that they have been emerging from a debauch. As the case stands, it looks as if the whole detective force of London was evaded by one man. In the case of a single murder very few escape; but here it is seven, and he is still at large. Already, from many a quiet home all over the land, there is the cry arising like Abel’s blood for vengeance. What recks it is that despite the fact that it is unfortunates, they are still immortals. These poor bedevilled sisters have been made what they are by scheming, lustful, degraded bad men. They have been made the victims of polished blackguardism, run out of house and home after being unable to make ends meet on the miserable starvation wages of sempstresses and shopwomen. There are many ways of murdering women besides using long knives to them. The drunkard and the libertine kill their tens of thousands, and few come within the scope of the coroner’s inquest. The Whitechapel murders throw white light on the villainy of London, and the worst of it is that in other forms and towns, perhaps more quiet and scarcely less revolting, the influence of vice, profligacy, and ruin can be seen, with unabashed effrontery mocking religion to scorn if helpless to meet the wants of humanity. Mr Archibald Forbes, writing to the Daily News on the motives of the Whitechapel murderer, takes another view. Probably a dissolute man, he fell a victim to a specific contagion, and so seriously that in the sequel he lost his career. Whatever shape the deterioration may have taken, that it has left him with a strong, steady hand, brain of devilish coolness, and an active step is not to denied. Medical men know how varied, how penetrating, how obstinate are its phases. It is a curious fact that some men are so constituted to conceive and foster a bitter hate and furious rancour against the hapless creature involved. Just as I have heard the British soldier wounded in action rave with oaths for the blood of the individual foe who had unwittingly struck him down from a far-off distance, so I have over and over again heard him pronounce the worst anathemas on an unfortunate woman.